Join the RRC Maple Grove, MN office June 14th from 8-11 AM for their annual RRC Blood Drive! Make an appointment by visiting https://www.mbcherohub.club/ and entering sponsor code 4040. Walk ins are welcome! 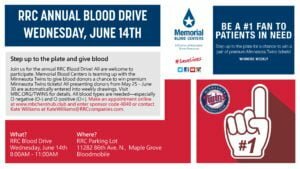 Step up to the plate and give blood Memorial Blood Centers is teaming up with the Minnesota Twins to give blood donors a chance to win premium Minnesota Twins tickets! All presenting donors from May 25 – June 30 are automatically entered into weekly drawings. Visit MBC.ORG/TWINS for details. All blood types are needed—especially O negative (O-) and O positive (O+). Wednesday, June 14th 8:00AM – 11:00AM Where?